What Are Common Summer Dangers For Dogs? 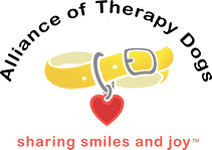 - Alliance of Therapy Dogs Inc.
As the premier therapy dog organization in North America, we know how much you and your dog look forward to summer. Summer ushers in the sun, the fun, and the things that can make your dog miserable – some of which are dangers. In this article, we will discuss common summer health dangers for dogs including heat stroke, sunburn, pollen, biting and stinging insects and fleas. What Can Affect My Dog’s Health During the Summer Season? Heat Stroke. It is not uncommon for dogs to be treated for heat stroke and there are several types of dogs that have an increased risk. Dogs that have shorter noses cannot cool themselves as efficiently as other breeds. Dogs can overheat very quickly. Once their internal temperature reaches 109 F (normal temperature is about 100-102.5 F), they will develop multiple organ dysfunctions and it will turn deadly. If there are indications that your dog is showing signs of heat stroke, bring her to a cool room or shaded area. Offer cool water, but do not force your dog to drink it. Never use ice or ice water to cool a dog as cooling too quickly will cause the blood vessels to shrink and can delay the cooling of the inner body. Place a fan directly on them and place wet towels over their neck, back, and armpits. Sunburn. Some dogs are more susceptible to getting burned by the sun. White dogs, for instance, tend to have fair skin underneath their fur which can pose a greater potential for sun damage. Dogs with naturally thin hair, especially the hairless breeds, are also at risk for sunburn and skin cancer. All canines, regardless of the thickness of their coats, have vulnerable areas of the body with less fur or none at all. The belly and the ears have delicate skin, and even a dog’s nose can become dried out and sore. Summer Pollen. Dogs allergic to pollen will lick, bite and scratch themselves because of the pollen that falls on their fur, ears and the pads on their paws. Dogs allergic to pollen will try to soothe themselves by licking, chewing and scratching those affected areas which can lead to other issues, including hotspots. Dogs with allergies often develop problems with their ears. The ear canals may be irritated and inflamed or they may grow infected with yeast or bacteria. Signs your dog’s ears are giving him problems include scratching the ears, head shaking, and hair loss around the ears. If an infection is present there will often be odor and a discharge from the ears. While respiratory symptoms are not common in dogs with allergies, they do occur. A running nose, watery eyes, coughing, and sneezing are typical allergic symptoms. Dogs with seasonal allergies are usually irritated by ragweed, grasses, pollens, mold. Dogs with weaknesses in their lungs can develop sinusitis and bronchitis, just as people do. Wipe your dog coat and paws with a damp towel to remove pollen and dander several times a day. Give your dog a bath using hypo-allergenic shampoo. Saturate your dog’s fur with a spray that contains oatmeal and aloe. Give your dog fish oil caplets. The omega-3 fatty acids can decrease inflammation which, in turn, decreases reaction to allergens. Stinging and Biting Insects. Dogs are curious. They love to run and chase things including insects, which in some cases can result in a sting or bite. This can become very dangerous, very quickly. Dogs often get too close to an ant hill, a beehive or a flower bed, where stinging and biting insects dwell. It is not uncommon for a dog to be stung or bitten by an insect, however, the reaction to the sting or bite can vary according to your dog and the type of insect. Typically your dog will experience only mild discomfort and should subside within a few hours. However, some stings and bites can cause more serious symptoms of varying degrees, including death, depending on the insect. Fleas. Fleas are small insects that feed on the blood of mammals. They have no wings and cannot fly but they jump from one host to another, laying eggs in the process. Fleas can also transmit diseases like plague and myxomatosis (especially in rodents and rabbits) and are generally considered a big threat to the well-being of dogs and families. Today there are countless chemical products available that effectively combat the flea problem, but there are also some natural treatment options and measures you could take to get rid of fleas and keep them from infesting your home and your dog again. Flea Comb. Flea combs are the easiest and most effective way of eliminating fleas. It keeps your dog well groomed, healthy and happy. Purchase a good quality comb that will remove the fleas including their eggs and larvae. Before using a flea comb with narrow teeth, make sure the fur on your dog is not tangled to avoid pain when you comb it. Enhance your dog shampoo. While there are many flea specific shampoos on the market, you can also turn ordinary dog shampoo into a flea shampoo at home. Add half a cup of any good dog shampoo to half a cup of freshly squeezed lemon juice and two cups of water. Pour this mixture in a bottle and use it to bathe your dog every week. For larger breeds, increase the quantities in proportion. After bathing, do not let your dog run around in grassy trails or lawns where fleas reside. Continue to comb the pet’s fur thoroughly and bag all the fleas. Apple cider vinegar. Add one teaspoon of fermented apple cider vinegar to a quarter liter of water and let your dog drink this throughout the day. The apple cider vinegar keeps the skin and coat slightly acidic which naturally repels fleas and ticks. However, do not directly apply the apple cider vinegar to the skin as it irritates broken skin. Consult your vet as to how much apple cider vinegar your dog might safely ingest. Wash bedding. Wash all of your dog’s bedding and any other fabric your pup likes to call his own. You will be surprised how easily you can eliminate the fleas, eggs, and larvae when you wash with a strong detergent. Drying is also effective in killing eggs, larvae and adult fleas. Put the bedding in the dryer, if possible. Dry it at the maximum heat for best results. Homemade flea collar. Use two drops of lavender oil or tea tree oil to one teaspoon of water and apply the solution all over your dog’s collar. You may also sprinkle the solution on a kerchief and tie it around your dog’s neck. This should keep the fleas at bay. Periodically vacuum the floor. Fleas like moist and warm areas. If you are not diligent about cleaning and vacuuming, your home can become a breeding ground. Your dog wanders and rests throughout the house all day, so vacuuming is essential to prevent fleas from multiplying and infesting your entire house and yard. Sidewalks. Pavement and asphalt can get very hot and can burn your dog’s paws. Find softer walking routes and schedule them for cooler times of the day. Some owners use “booties” on the dog’s paws as a barrier to the hot pavement. However, most dog’s find them intolerable. The summer months are what many of us wait for every year. Spending time caring for your dog from mostly preventable health problems is no fun for you or your dog. If you have any questions regarding keeping your dog healthy this summer, contact the Alliance of Therapy Dogs.